Hello! How’s everyone’s weekend so far? Today has been a very efficient day! Woke up at 6:30am ( I know…on a Sat?! it’s the new momma syndrome.) and tidied up the house. By 10am I was done decluttering our place, did a load of laundry, and headed into the city. ALL BY MYSELF. Told the husband that I needed some ‘me city time’ and had a peaceful and much needed time roaming the streets of downtown. Later during the day, we went to Phatom Gourmet’s BBQ Beach Party (another posting later), and took Zoey to Rowes Wharf, the waterfront area where we departed on the Odyssey cruise ship out into the Boston harbor for our wedding reception. It was great seeing the place again since it’s been a while. Weather was nice, warm and toasty as summer should be. I can’t remember if I ever wore a T-shirt dress before, but it was so perfect for a typical summer day. Super comfy + light. Also seen here, Zoey grabbing onto ‘her’ chewbeads. 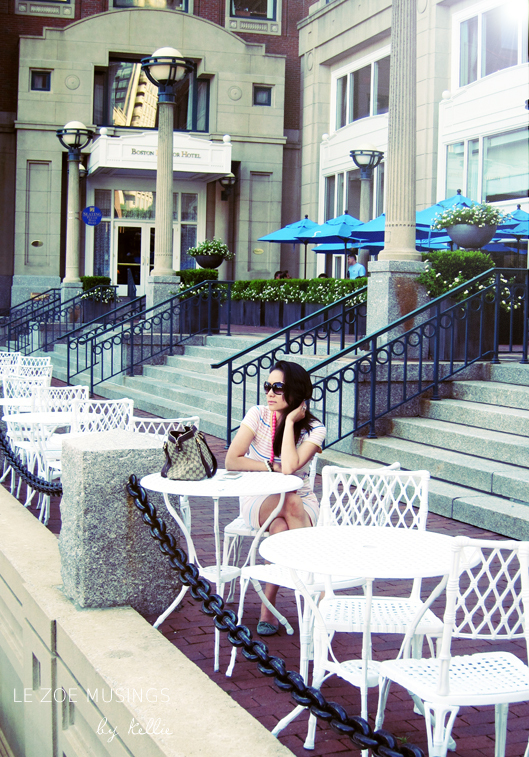 I LOVE the rows of white tables and chairs lining the marina. 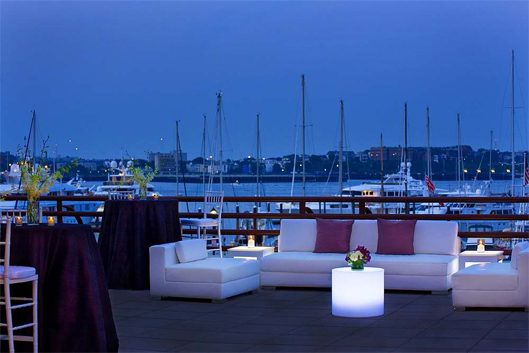 To the back is the Boston Harbor Hotel, right is a restaurant, and left is view of Boston harbor where you’d see boats docking at the marina. Breathtaking views at night time! A glimpse of the marina in the background. View of the arch from the inside. The banner says ‘Summer in the City’, what a great declaration! Sunnies from Oscar de la Renta. Gotta love ’em! LOVING the neon pink chewbeads! Here’s a previous post about chewbeads if you are unfamiliar w/ them. This is the view of the harbor from the balcony of the Mariott’s Long Wharf. Image via M.L.W. And here we were! Three yrs ago (wow!) catching the Odyssey and heading out into the harbor for our reception. 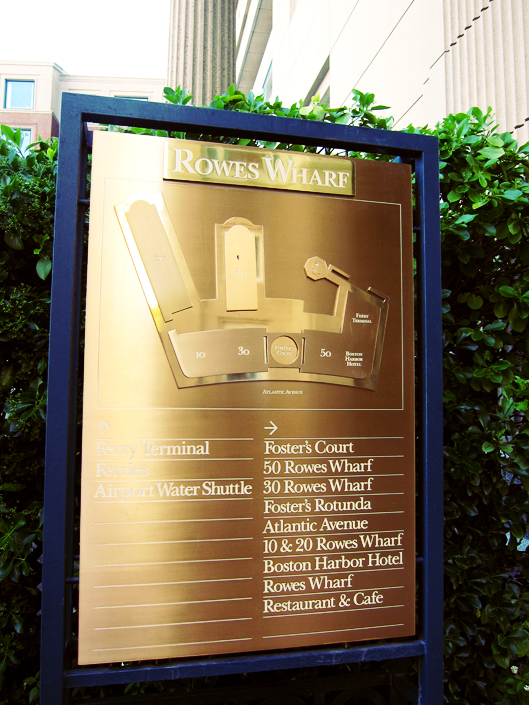 If you are planning a trip to Boston, Rowes Wharf is a must see for that relaxation stroll, water view dining, and/or just plain old eye candy sightseeing. Great photos! Loved your blog very much. What a great idea to do a tour like this with your daughter. I commend your energy, though! efficient morning, and me time, and Zoey time all in one day? Super Kudos! Thanks Ayna! Have a GREAT day. Best, Kellie. Wonderful photos and a great post! Thanks for visiting my blog. thanks for stopping by dreamlovebelieve.com, Kellie! HI Glor- I couldn’t agree w/ you more. I LOVE Boston and yes I’ve been to Newbury st! It’s amazing! Have a GREAT day. Best, Kellie. I need to get some of those chew beads for my twinsies! I’m in LOVE with your wedding dress. Gorgeous! I love your t-shirt dress + great color combinations esp to your chewbeads. Great photos! And what a beautiful dress! 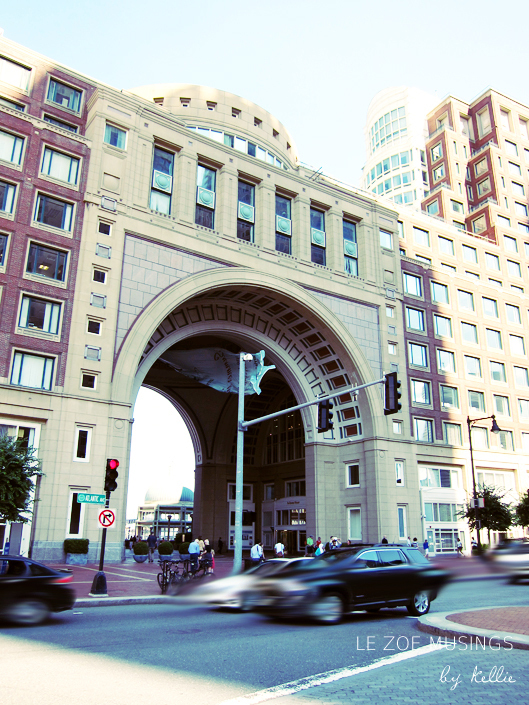 This Californian thanks you for the peak into such a beautiful part of Boston, a city I hope to visit someday! 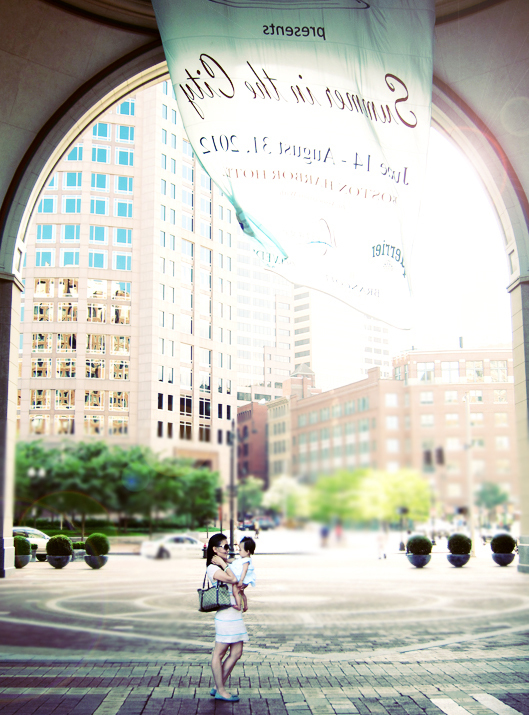 No wonder you picked this location for your wedding day…it’s GORGEOUS! Absolutely beautiful! Boston is always stunning. Super post! I can understand the waking up at 6-630 on the weekrnds. We havent been able to sleep past 6 for the last six months. Think we will take your advise, coming out east next week and will try the warf. thanks for makeing our state look so gooood!!! your friend The D.A. Such a beautiful post. You are a cute mommy 🙂 so inspiring !! I LOVE that dress!!!!!!! Brilliant!